An award-winning scholar specializing in human resources and industrial relations, Hunter currently serves as the president of the Industry Studies Association in addition to his role as dean. The ISA is an international organization of scholars across academic fields. Like other ISA members, Hunter’s own research seeks to develop knowledge through direct fieldwork and a deep understanding of the dynamics of specific industries. Hunter’s work spans industrial settings, from nursing homes to the auto industry, to retail banking and call centers, with a focus on how workplaces and human resources can be managed to promote both organizational goals and positive outcomes for workers. 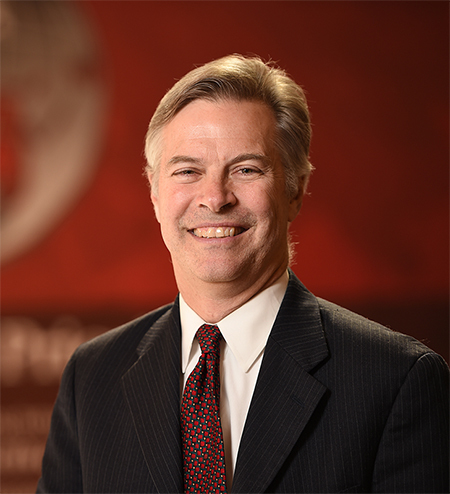 Prior to his WSU appointment, Hunter was the senior associate dean of the Wisconsin School of Business at the University of Wisconsin-Madison. He served on the Wisconsin faculty for 13 years, where he taught courses in human resource management and in negotiation, winning multiple teaching awards, and being named to the Pyle-Bascom Professorship in Leadership. Preceding his appointment as senior associate dean, he had directed the school’s human resource management program and subsequently led its nationally ranked MBA program. Before joining the University of Wisconsin-Madison in 2002, he spent eight years on the faculty of the University of Pennsylvania, where he also won several teaching awards. Hunter earned his bachelor’s degree at the Wharton School of the University of Pennsylvania, where he was named a Harry S. Truman Scholar. At Penn he was awarded a Thouron Scholarship to study in the United Kingdom, and he holds a master’s degree in philosophy, politics, and economics from Oxford University. Hunter earned his doctoral degree in industrial relations and human resource management from the Sloan School of Management at the Massachusetts Institute of Technology. Hunter was raised in the Palouse, graduating from high school in nearby Moscow, Idaho, where he was a U.S. Presidential Scholar.